'Slumdog Millionaire' was not the only movie based in India that took home an Oscar in 2008, just the biggest one - 'Smile Pinki' on the other hand is the littlest one but thanks to HBO it's getting some major airplay this month. I simply love when movies drop me into the story without any inkling of what I am getting myself into. 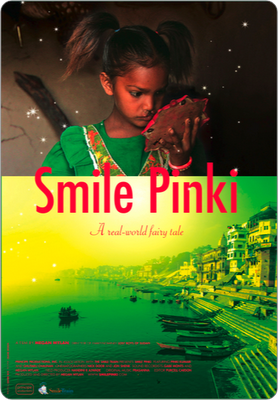 Set in India, 'Smile Pinki' tells the tale of a girl named Pinki who lives in the village of Mirzapur in Uttar Pradesh. Pinki was born with a cleft lip that led to her being ostracized by her community and eventually to her dropping out of school due to constant ridicule by her classmates. The film begins with a social worker from The Smile Train who literally walks from person to person with leaflets detailing how free operations are being offered to any child born with a cleft lip or palate. The camera then follows the trail of one of the leaflets to Pinki as well as one to a boy named Ghutaru. The story just unfolds organically from there scene by scene as we learn more about the children and their daily lives. I usually keep my posts as spoiler free as possible but from the first time we meet Pinki we instantly form a bond with her and her father. We hope that this fairy tale of a story will end happily as the heartache of how deeply these children are affected by their deformity comes fully into view. The makers of the film never bombard the viewer with the why or how this charity came to be - just that it is and that it's changing lives one child at a time without any great fanfare. As HBO's president of documentary and family programming Sheila Nevins explained, a good doc can uniquely provoke "feeling for someone who was a stranger to you five minutes ago. You didn't know that person, you didn't know that issue and suddenly that person becomes a part of your human family." There are many lessons to be learned from this magical little movie and some of them are quite obvious - to appreciate the things we have in life when others have so little, the unflinching love of a father who wants nothing more than what's best for his child and that children never cease to surprise us despite what life throws at them. But it was the subtle idea that you don't necessarily have to save someone's life in order to save them that stayed with me long after the credits rolled. Yes, children in developing countries are in need of basic necessities to just stay alive but what about after that? In a place where deformities are still blamed on the supernatural and black magic, looks are not just skin deep - they go much much deeper. And seeing what this one operation that takes just 45 minutes and costs all of $250 made me want to go to India and spread the good word about The Smile Train myself. Not that one actually needs an excuse to ever go there but now you have one. I just happened across this -- it was probably one third through when I discovered it and sat down to watch. I loved it and am glad to know that HBO will be featuring it again as I would love to see what I missed and to enjoy another viewing. I too enjoyed the music -- where does one find it? Thanks for the post -- hopefully a lot of other people will now discover this lovely little film too. This documentary sounds fantastic- if for no reason other than the fact that it elicited such a visceral response from you with a mere 40 minutes of footage. When is it airing? How did you come across it? Sally - It's playing several times this month and I have been recommending it to everyone I know. The music (as far as I know) is composed of pieces of sitar, sarod & santoor work. Look for albums on amazon/itunes by Amjad Ali Khan, Satish Vyas & Nikhil Banerjee. Thanks for stopping by! Ayesha - I just randomly came across it while surfing HBO and considering my moniker I should have been more on top of finding it ;) It's just these documentary shorts are so hard to find (not even available on Netflix) so not sure where to find it if you don't have HBO.